I had a canvas print of this image on my studio wall before it went to the client. It drew lots of questions about how it was created. How did I make her hair go like that? How do you get a pure white background? Is that shape real? And lots more. Below I have outlined the steps in making this image. Step 1 – Plaits. This young lady has very, very long hair. She is tall and it goes all the way down her back. Step 1 was to get her mum to plait it. I didn’t see this part, but it must have taken some time for such long hair! Step 2 – Studio set up. This shot was taken in studio, against a white background. I have written an earlier post about how to get a pure white background. If you don’t have a studio backdrop you can achieve the same effect with a white wall or nearly white wall. I had two lights with small soft boxes on them positioned on left and right at 45 degrees to the subject. You can see the catch-lights from those in her eyes. Step 3 – Shaping the hair. In this image, I was aiming for a fun / quirky image. To shape her hair – we improvised! 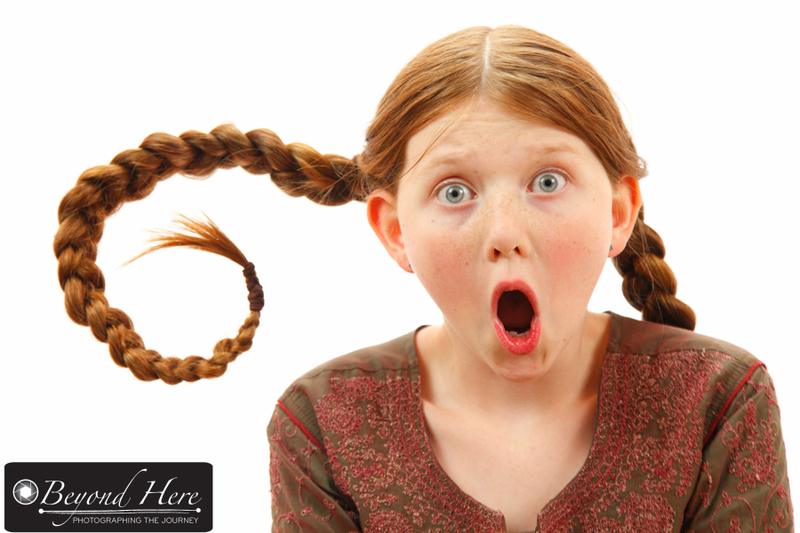 We unwound a wire coat hangar and threaded it through the middle of her plait. That made it possible to create a range of different shapes from her plait. The coat hangar protruded out of her hair. In this image it protruded to the left, where her mother was holding it. Step 4 – Removing the visible part of the coat hangar. In each of this small series of images, part of the coat hangar was visible. It stuck out from her hair, and out of frame where her mum was holding it. To remove the coat hangar wire from the image required less than 5 minutes in post production, using the stamp tool to replace the wire with pure white from the background. It does not need a long tedious studio session and hours in post production to make interesting images. This one took about 20 minutes from beginning to end (after her hair was plaited!!) I hope this was helpful to you, and that you understand the process for making this image. Do you have a story to tell about making unique portraits? This entry was posted in Photography Tips, Portraits and tagged family portrait, family portrait photgraphy, family portrait photography, portrait photography, portrait photography tips on September 29, 2014 by Craig Dingle. I like to read photography books, and particularly books about the business of photography. I’ve been considering a ‘Great Reads’ section on this blog, so that readers of Beyond Here have an easy reference to a range of great photography books. So here it is! The first post under the category of Great Reads. I’ll keep it short and sharp, and hopefully nothing like the dreary book reviews I did in high school English class! This week I have re-read an outstanding book called Fast Track Photographer by Dane Sanders. What is it about? Fast Track Photographer will challenge the way you think about your photography business and your role in the photography industry. It doesn’t look at photography tips, or equipment, or composition. It assumes your level of photographic capability is at least good – and highlights that the key differentiator of your photography business is not your images, products, or equipment. The key differentiator is you. It then builds on that concept by encouraging you to focus your time and effort where you can add value, and to outsource tasks where you can’t. This is radical thinking if you are in start up mode and doing everything yourself. What can you expect? Challenge! If you are starting out in your photography business or are already under way this book will challenge how you think about your business. It provides an online tool to assess your level of capability and then outlines different types of career options. Sanders divides that into two distinct options – Signature Brand Photographers and Freelance Photographers. He describes each and helps identify which skill sets will suit each option. Visual content? None! Yes, this is a book about the business of photography that has no images in it. It is 240 pages of text. This is a master stroke from Sanders as you do not get distracted by great images, you focus on the content and the message. Yes, its a great book about the business of photography with absolutely no images. Outcomes? Fast Track Photographer will help you to consider what makes your photography business different, and how to maximise those differentiators. It will also challenge you to outsource all of the tasks within your business which you do not add value to. After reading this book I am clearer on the key offerings I bring to my wedding photography clients. Rating and Recommendation? Wow. This book can radically change how you think about and operate your photography business. For me it has been a huge help for my own business. And so has Sanders follow up book The Fast Track Photographer Business Plan. I recommend this book to anyone starting up a photography business, or who is already operating but finding it hard going. 10 out of 10! Thanks for reading the first in this series of posts Great Reads – Fast Track Photographer. I welcome your comments. Please add them to this post. Have you read Fast Track Photographer? What were your key learnings? This entry was posted in Great Reads on September 25, 2014 by Craig Dingle. Last weekend iStock, one of the leading microstock photography agencies, implemented some significant changes in the pricing of their images. I outlined those changes in the post My Take On this Weeks iStock Announcements. So what has happened since then, and is it moving iStock forward? The most significant change iStock introduced was to make files of all sizes the same price. Previously a small size image would be cheaper than a larger size. That meant that buyers who were using the image on the web only would buy the smallest size, and a buyer who was going to use the image in print would buy a larger sized image for a higher price. After the changes, all sizes are the same price. So what has been the impact on buyers and contributors? After less than a week of the ‘new iStock’ there is mixed reaction from buyers and contributors. Buyers who mainly purchased small size files for web use have been very vocal that the changes have resulted in a large price increase for them. And in effect, for this buying group, they have. These buyers have expressed their anger in iStock discussion forums and in social media. Many have said that they will use up their current credits and then move to other microstock agencies. To see some examples, check out the iStock facebook page. For me, as an exclusive iStock contributor, it’s pretty ugly reading. What is unknown is the response from large buyers who mainly purchase larger sized files. For this group the changes are effectively a price decrease. So that should mean an increase in downloads. The way the new pricing structure works, this group has an incentive to use the subscription program rather than make individual downloads. While individual sales are reported as they happen, subscription sales are only reported in the middle of the following month. So subscription sales being made in September will not be reported to contributors until the middle of October. It won’t be until then that contributors will know whether there has been a large increase in downloads from this buyer group. What has the contributor response been to date? Well, it has been more balanced than the buyer response. Some are reporting an increase in sales, but many are reporting a decrease. Contributors with a lot of content in the Vetta collection seem particularly upset. These high priced files have become much more ‘affordable’. The price decrease also means a decrease in royalty per download for the contributor. To generate the same total royalty will need a large increase in volume which is not apparent yet. But in reality, contributors will not know the total impact until subscription sales are reported in the middle of October. What’s my experience? My downloads and average $ per download have both decreased since the changes. That said, we are less than a week since the changes were made. I am going to resist the urge to jump to any conclusions until we have more data. I’m sorry and disappointed that many buyers of small images are upset and are considering moving to competitors. But I don’t yet know the impact of larger buyers through the subscription program. I will wait to see those results before considering changing course. I am hoping there has been a large increase in subscription sales. iStock and its owners, Getty Images, will be hoping so too. The direction they are taking iStock is very difficult to reverse, and the customers who leave will be nearly impossible to attract to return. Such a big move would not have been made without detailed research – now I hope the reality matches the research. Fingers crossed. Are you an iStock buyer or contributor? Do you think the changes are moving iStock forward? This entry was posted in Craig's Comments, Stock Photography and tagged iStock, iStockphoto, microstock, microstock photography on September 19, 2014 by Craig Dingle. In the last week I have been working with a photographer who is considering turning his hobby into a business. He has had positive feedback on the work he has done to date – which has focused on family portraits. He has also shot 2 weddings this year. As I have helped him, we have worked through issues ranging from the quality of his work to the challenges of a variable income. He is not the first photographer to grapple with doubts about launching a business. In my experience, most don’t know what they are getting themselves into. I have put together this starter list of questions if you are considering turning your hobby into an income. Here they are – 6 questions to ask yourself before launching a photography business. 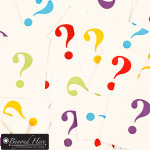 Question 1 – Am I Passionate About Running a Small Business? All of the photographers I have spoken to about turning their hobby into an income have been planning to start a small business. In the same way that I run Craig Dingle Photography Pty Ltd, they are considering establishing and running a small business. For photographers reading this – I am assuming you are passionate about photography and image making. The key question to ask yourself is – am I also passionate about running a small business? Will I welcome the challenges which come with small business? Generating new clients? Following up people who haven’t paid their bill? Doing book keeping and taxes? When times are tough, will I welcome the challenge and find a way forward? I have deliberately put this question first. It is a very important question to ask yourself. Are you up for the challenges that come with running a small business? Question 2 – How Will I Handle the Challenges of a Variable Income? I don’t know any photographers who have a steady income every week. They must be out there, but I don’t personally know any. Where I live there is always more business around in spring and summer than there is in autumn and winter. Whether that is family portraits, weddings, real estate photography, or other work – there is not a steady supply of business all year round. Even in stock photography, the income slows down very predictably every northern hemisphere summer. A variable or seasonal income is very different than working for a corporate and receiving the same pay check every week or month. Have you considered this? How will you handle the lean weeks? Months? Seasons? Will you shoot some business events when the wedding season slows down? How will you find this business? Are you prepared to shoot jobs, which might not be your favorite type of work, to make ends meet in the lean months? Question 3 – How Will I Generate New Clients? This question is key. If you plan to add your work to your facebook page and think that will generate new clients for you, I suggest its time to pause. How much business has your facebook page generated to date? In most cases, the answer is not much. You are going to need a solid plan for generating clients if you want to make a fair income from your photography. Are you going to advertise online, in your local school newsletter, by tapping your range of contacts, attending bridal shows? A solid plan around how you will generate clients will vary depending on what type of work you want to do – but having a good plan is key. New clients are unlikely to start calling you out of the blue just because you have set up a business. You will need a plan to generate new clients. Question 4 – What Unique Offer Will I Be Bringing to the Market? There are lots of photographers out there, and the number is growing every day. What is the unique thing you will bring to the market? Why will clients choose you? What sets you apart? If you have 2 minutes to talk to a potential client – what are the key points you want to make? This is a challenging and important question. It takes time to work through this one, and a strong answer can help you with understanding how to generate new clients. Is it the the experience you will give your client on the day? Is it your unique product offering? Is it your one of a kind shooting style? Are you a specialist in a niche? What else? If your answer is ‘my friends and family say my images are great’ or ‘I’m told I have a great eye’ these are danger signs. You need to know specifically what it is that you will be bringing to market, and why a client should choose you. Question 5 – Is My Work Good Enough? This is a perennial question for photographers! The more clients you work with, the more your confidence will build over time. When you are starting out, a slightly different question can sometimes help. If you have been asked by a friend to shoot their wedding – consider asking ‘Am I confident enough that I can charge $X?’. Often a first time wedding shooter will not be confident and will feel anxious about shooting their first wedding. If that’s the case, discuss that with the client and perhaps shoot with no charge. A client will appreciate your honesty and forgive some rookie errors if you have been frank with them. They are unlikely to be happy if you try to maximize your income from this wedding and then miss key shots. Think about building a foundation for your business. 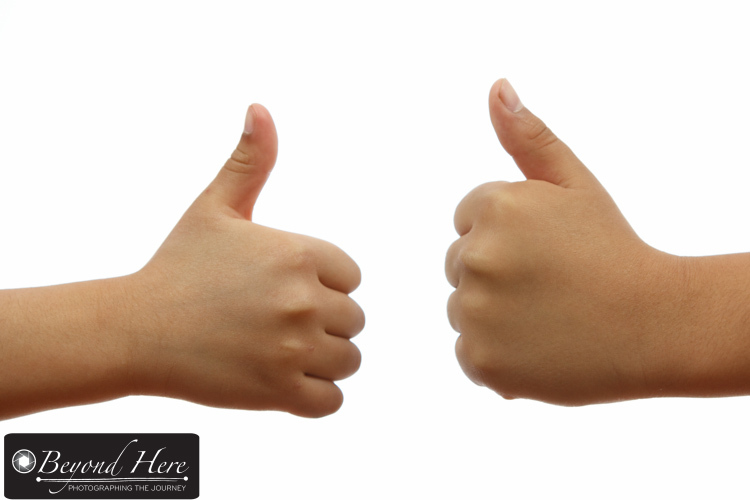 You want happy clients, and you want them to refer you. Make building a strong foundation your business focus when you are starting. Question 6 – Am I Prepared to Learn? Regardless of your answers to the first 5 questions, if you are prepared to learn you can make it. If you are prepared to learn – mistakes are progress not problems. Every mistake will make you better. Every positive experience will give you a new learning about what works. If you don’t know how to run a small business but are prepared to learn, you can build your skills and business over time. There are thousands of photographers out there – and that number is growing. Don’t be overwhelmed. If there is space for those photographers, there is space for you too. If you are prepared to learn you can make it. This entry was posted in Business Tips, Craig's Comments and tagged photography business, photography business tips on September 12, 2014 by Craig Dingle. Thanks very much for being one of over 200 readers of Beyond Here in its first 3 months of existence. I started this blog in June 2014, and it is great to have more than 200 readers from around the world, lots of emails about topics that you would like covered, a guest contributor, comments on the blog, and a number of subscribers. If you would like to be a subscriber, just fill in your email address on the side of the page, and then look out for the confirmation email (be careful, it might end up in your junk mail folder). Once you are a subscriber you will receive a weekly email with links to the most popular recent posts. Here’s to the next 3 months of Beyond Here. This entry was posted in Craig's Comments on September 7, 2014 by Craig Dingle. Over the last 3 months I have written a series of posts on Beyond Here about stock photography. Several readers have since opened microstock photography accounts and become contributors. Many are turning their passion for photography into an income. Super. In those posts I have shared my positive experiences with iStock, where I have been a contributor since 2008 and an exclusive contributor since 2010. This week iStock announced some significant changes that will come into effect on 15 September 2014. Here’s my take on this weeks iStock announcements. First, some background. In April 2014, iStock introduced a subscription offering in addition to its normal offer. This allows high volume image buyers to purchase high volumes at a fixed price. This is an area where competitor site – Shutterstock – had been doing considerably better than iStock for many years. iStock’s subscription offer seemed to be a re-focus on the large volume buyer. In this weeks announcement iStock states that ‘in only a few months, these subscriptions now represent a meaningful percentage of total iStock sales and materially increased spend per customer’. It is the final part of this message which I find interesting – the ‘materially increased spend per customer’. 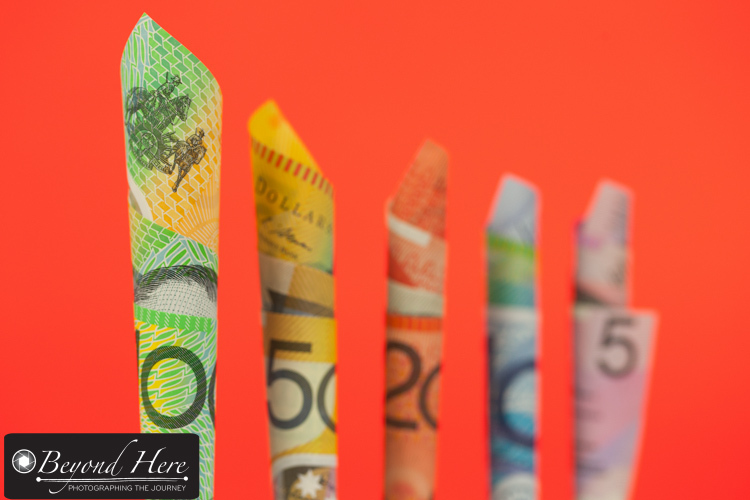 In microstock photography there has long been an obsession with the calculation of dollars per download to assess value. The statement from iStock suggests their thinking has changed. If a customer is spending $1000 per month on images and buys 1 image from iStock for the month for $100, the revenue per download is $100. What that statistic overlooks is that the customer is spending $900 with competitors. The announcement suggests to me that iStock are refocussing to look at that remaining $900. Unfortunately for the buyer, iStock’s highest quality content has previously been excluded from the subscription offer. That is about to change. iStock are taking several steps to ‘dramatically improve the simplicity of the iStock site, search and messaging’. iStock previously offered two ways to pay – the buyer could use credits, or they could use a credit card to pay for images directly. The credit method suited the regular buyer, the credit card method suited the occasional buyer. Going forward buyers will only be able to use credits. Discussion in the iStock forums suggests that this change will simplify the coding on the site. It seems again, that iStock are focusing on the needs of the large volume buyer and are prepared to fore-go the needs of some smaller buyers. This seems a fair trade off, if the large buyers in the example above bring more of their monthly budget to iStock. I like this approach. It strikes me as another application of the 80/20 rule. I expect 80% of downloads come from 20% of buyers, and iStock seem to be tuning in to that 20% of buyers. iStock’s collections were previously divided into 4 areas – Main, Signature, Signature+, and Vetta. From the middle of September that will be consolidated into 2 tiers – Essentials (standard content) and Signature (premium content). The old Main content will become the Essentials tier. The old Vetta, Signature+ and Signature collections will form the new Signature tier. The big implication here is that Vetta and Signature+ content will become significantly cheaper – good for buyers, and potentially good for contributors only if an increase in downloads makes up for the reduction in royalty per image the contributor will receive (because of the lower price). The second big implication here is that the best content on iStock (Vetta) will now be available to those buyers who have taken up the subscription offer. This will make the subscription offers more attractive. Currently the price paid per file downloaded depends on which size the buyer wants. A small file suitable for web use only is cheaper than a large file suitable for printing. From the middle of September the price will be the same regardless of the size. This is a very big change for iStock. It will make life much simpler for buyers. It will be to the advantage of buyers needing large sized images and to the disadvantage of buyers only needing small sized images. Again, this seems to support the view that iStock has asked and listened to what the high volume image buyers want. And they seem to want access to the best images in the subscription offer, simpler collection structures, lower pricing, and more transparent pricing. iStock’s moves are bold and have the potential to re-shape the microstock industry again. iStock has a reputation for having a high quality collection of images – and the Vetta collection is the jewel in that crown. There will be high volume, large budget buyers who are now considering switching to iStock. There will also be current iStock customers considering spending more of their total budget with iStock. I expect these moves will generate a higher volume of downloads, at a lower average price per download. iStock will be counting on the volume increase to drive total revenue increases. Whether that happens will be known in a few weeks. There is a lot at stake for iStock. Successful execution could see benefits for buyers, contributors, and iStock itself. Failure could see current customers move to competitors, and exclusive contributors looking for alternative sales avenues for their images. Overall, I am very positive about the boldness of this strategy from iStock. I can see benefits for buyers and contributors. But having a good strategy is only half of the challenge – being able to execute it is another question. iStock’s record for implementing major change over the last 5 years is not great – I’m hoping this time it will be different. iStock is making a big move in 2 weeks time that may re shape the stock photography industry. It seems to be focussing on the needs of the high volume, large budget buyer. I like the focus and the offer. As an exclusive contributor I just hope iStock execute this well. That’s my take on this weeks iStock announcements. What’s yours? This entry was posted in Craig's Comments, Stock Photography and tagged microstock, microstock photography, stock photography on September 5, 2014 by Craig Dingle. I am a big fan of wildlife photography. The world around us is amazing and so are the animals in it. Here are 8 quick tips to add interest to your wildlife images. Multiple Animals. A single animal on its own can create a great image, but multiple animals in the frame adds real interest. The image becomes about that type of animal, but also about the interaction between them. 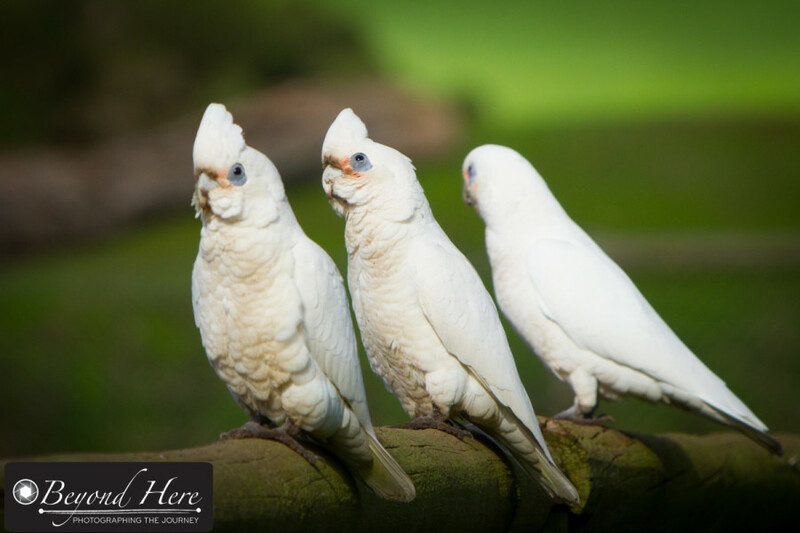 These corellas look like they are working as part of a team to keep an eye out for potential danger. It is harder to shoot multiple animals in one frame – but look out for these opportunities. 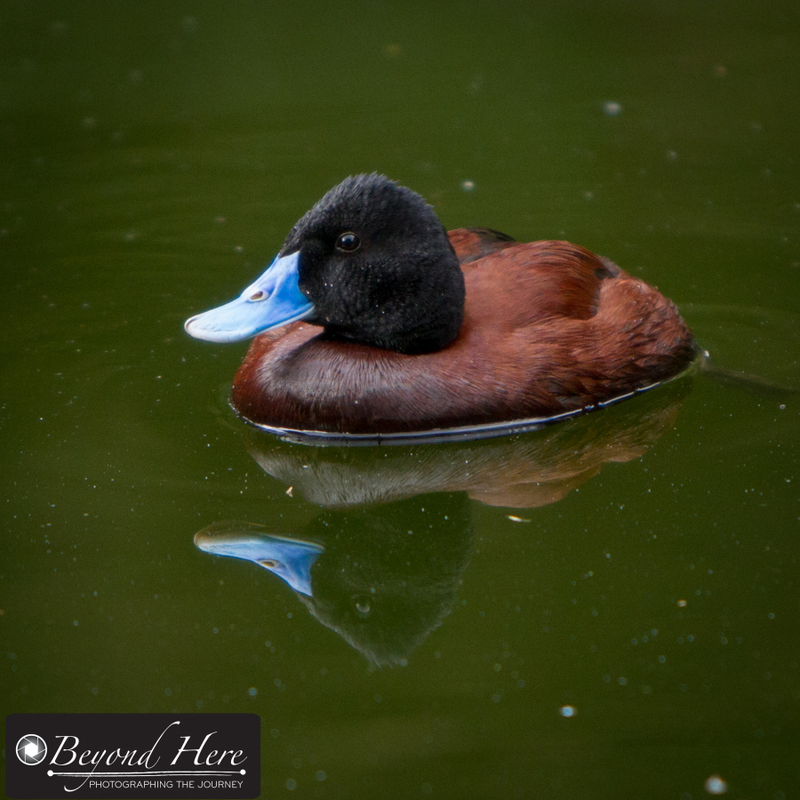 They are a good first step for how to add interest to your wildlife images. Baby Animals. 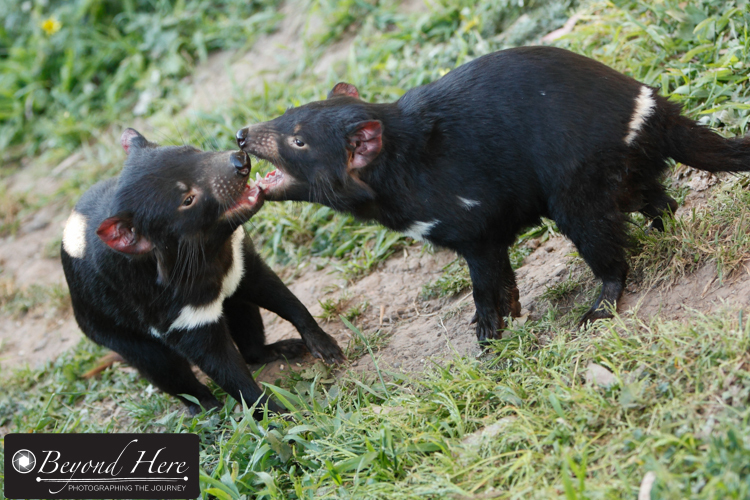 If you want to get a strong reaction to your wildlife images, look out for baby animals! There is almost a guaranteed ‘wow’ if you can shoot images with baby animals in them. 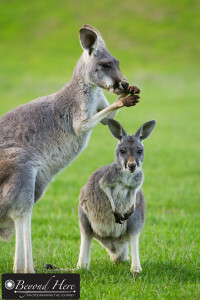 In this image of a red kangaroo and her joey, it appears that the joey is peering out from the protection of its mother to see what the photographer is doing. The size difference between the two animals, and the cute ears, mean added interest to a single animal or two adult animals. Baby animals are a very easy way to add interest to your wildlife images. I wrote a previous post about this, which you can see here. Clean Backgrounds. Like with any sort of portrait a clean, clear background will help your subject to stand out in the image. And this will help focus the viewers attention on the subject. 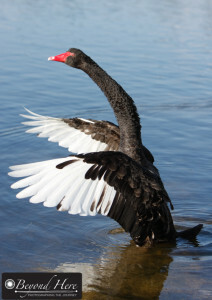 This image of a black swan was taken in Perth, Western Australia. Fortunately when swans flap their wings like this, they tend to do it several times. This enabled me to get in a position with a clear, water background. It has no distracting lakes edge, or reeds, or people walking past the lake. When you are next out shooting, see if you can add interest to your wildlife images by removing any distractions in the background. Clean backgrounds help to produce compelling wildlife portraits. Interaction. One of the benefits of having multiple animals in your image is that you will often see them interacting. 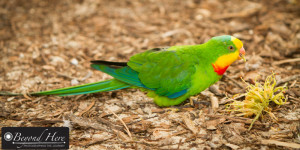 Not only can you get a great image of the animals itself, your image can provide insight to the connection between animals. Wait for the moment when the two animals connect. Close Ups. Getting really close up can add a lot of interest to your wildlife images. Through your camera and your image, you can provide a view that is not possible to the human eye. 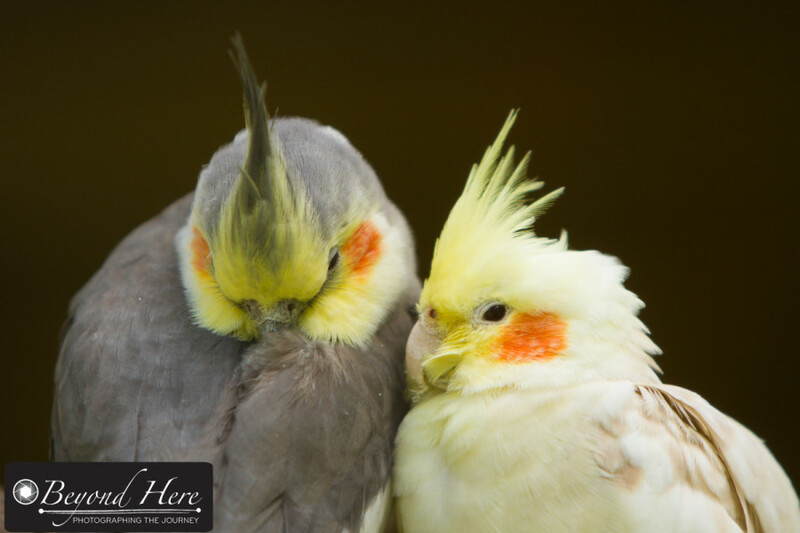 This cockatiel pair would not let me get this close if I was standing near them, but with a zoom lens we can see them in close up. Reflections. Reflections can add a lot of interest to your wildlife images. I wrote an earlier post about this which you can find here. 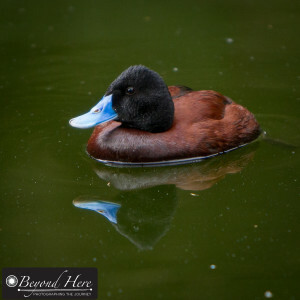 This is a blue billed duck. See the interesting reflection in the lake. Good reflections need still water. Often the best time for this is in the early morning. If you are an early riser, take advantage of the reflections at this time of day. Action. Animals in action adds a lot of interest to wildlife images. 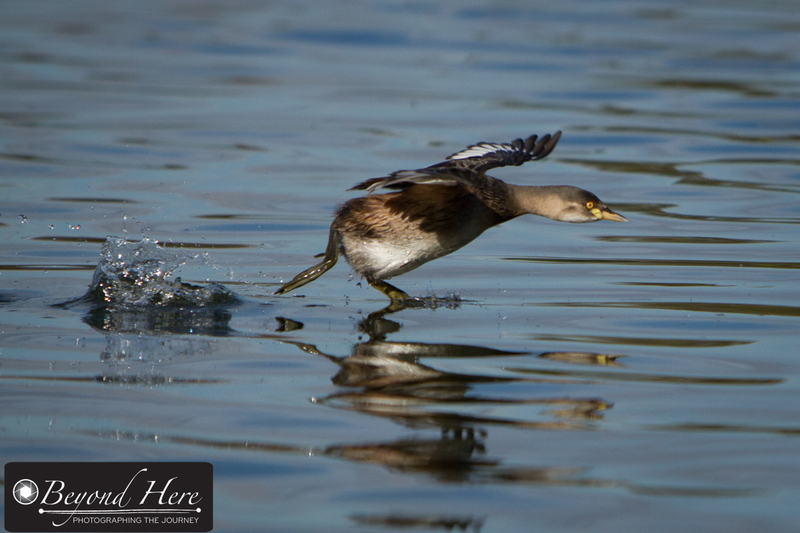 This bird is a grebe and this shot was taken at a lake in Perth, Western Australia. It is common for these birds to run across the top of the water. Be patient and use a fast enough shutter speed to freeze the action. Color. Animals come in a very wide range of colors. Bright colors attract our attention in any image. 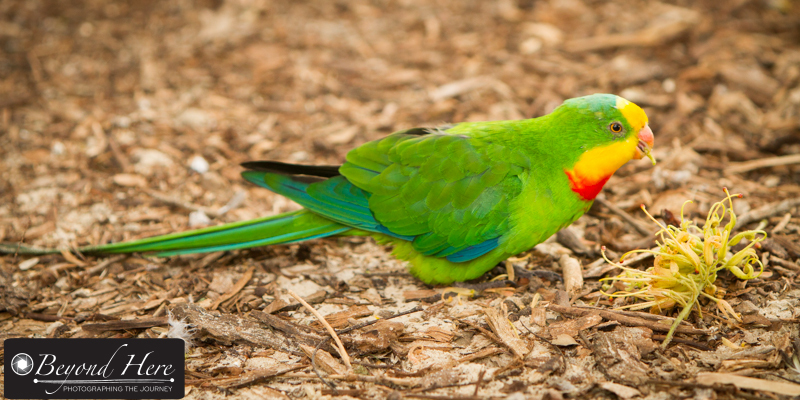 Look for bright colors to add interest to your wildlife images. That’s it for 8 quick tips for how to add interest to your wildlife images. Happy photographing! This entry was posted in Photography Tips, Wildlife and tagged photography tips, wildlife, wildlife photography, wildlife photography tips on September 3, 2014 by Craig Dingle.